An easy, healthy and delicious high-fiber & high-protein gluten-free and vegan flatbread pizza crust made with just a few simple ingredients! As an added bonus, this delicious red lentil pizza crust can also be used to make lentil chips, tortillas and crackers ! This beautiful flat bread packs a major protein & fiber punch; as well a supplying a hearty amount of potassium, calcium, and zinc, too! Super easy to make, and with a very neutral, yet delicious flavor that complements pretty much any topping you can think of, this flatbread makes a wonderfully healthy staple to any diet. It tastes great served cold or warm, and makes an excellent pizza crust as well! Ridiculously simple and easy to make. Rich in fiber, protein, folate, copper, potassium, and iron. Gluten-free, vegan, dairy-free, soy-free, yeast-free, nut-free, sugar-free. In a pinch, if you have a good quality high-speed blender or food processor, you can get away with soaking the lentils for a minimum of three hours (if you’re short on time). This is a versatile recipe. You can omit the garlic and/or add any variety of spices you would like to the batter before baking. Do you want a softer flatbread-like crust? Follow the instructions in the recipe card. Do you want a firmer crust? Use 6 tablespoons of water instead of 1/2 cup before blending and bake for 25-30 minutes. This delicious lentil pizza crust can be enjoyed warm or cold! This red lentil flatbread is also great served without toppings alongside soup, chili, salad, or dips. This lentil pizza flatbread pizza crust has a rather neutral flavor and can accommodate a variety of toppings and flavors. 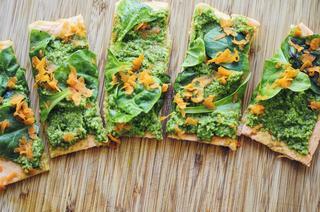 What else can I make with this Red Lentil Flatbread Pizza Crust batter? I’ll let you in on a little secret: this batter can be use to make Red Lentil Tortillas, Red Lentil Chips AND Red Lentil Crackers! Pretty cool, eh? Follow all recipe instructions up to blending the batter. Heat a greased skillet over medium heat. Pour red lentil batter in a thin layer to coat. Cook for 2-3 minutes or firming up. Flip. Cook 2-3 minutes longer. Set aside, and continue with remaining batter. Enjoy! Follow all instructions up to blending the batter. Spread the batter more thinly than you would for pizza crust (1/4-1/8”). Follow remaining instructions. Remove the flatbread from the oven and slice into chip shape(s) of your choice. Brush the chips with oil and return to the oven. Bake for 5-10 minutes or until very firm, crisp and turning golden. Let cool before serving! Enjoy. Instead of spreading the batter pizza crust-thin, you’re going to spread it more thinly (1/8-1/4”). Follow remaining instructions except bake for 15 minutes. Remove and score the flatbread into the cracker(s) shape of your choice. Place back in the oven and bake 5-10 minutes or until firm and turning golden. Let cool completely before breaking up (along score lines) into crackers. Enjoy! An easy, healthy and delicious high-fiber & high-protein gluten-free flatbread pizza crust made with just a few simple ingredients! Place your lentils in a lidded jar or bowl & cover with water. Soak overnight, or at least 6 hours.Drain & rinse your lentils.Preheat oven to 425°F. Line a cookie sheet with parchment paper, set aside.Place soaked lentils & 1/2 cup water in a food processor or blender.Blend until smooth.Add garlic, salt, and baking powder. Blend well.Drizzle your parchment lined cookie sheet with olive oil.Pour your flatbread batter onto your parchment paper & spread with the back of a spatula into desired shape, about 1/4-1/2" thick. Drizzle lightly with olive oil.Bake for 20-25 minutes, or until firm and edges are beginning to turn golden.Top with desired toppings* and eat as is, or place under a broiler for a few minutes for warm/melted toppings.Enjoy! *Toppings as shown: my Cilantro Pesto, mixed greens, shaved carrot, salt + pepper, feta cheese.